Skillet chicken fajitas are so easy to make, and their seasoning is amazing. Simply pan fry peppers and onions, then pan fry the chicken, mix and serve! These easy skillet chicken fajitas are one of my favorite weeknight dinners to make for my family. No wonder I make them so often! They are easy, tasty, and ready fast. I almost always have chicken breast in the fridge (or freezer) and onions in the pantry. Bell peppers keep well for several days, so I tend to always have those too. I always have the ingredients needed for these easy chicken fajitas, and everyone raves about them whenever I make them. So I end up making this dish almost weekly. It’s a truly easy recipe. Quickly mix the seasonings and season the veggies and the chicken pieces. Then pan fry them in a hot skillet. From start to finish, chicken fajitas are ready in about 30 minutes, including chopping the vegetables! How to serve chicken fajitas? Traditionally, they are served in flour tortillas. But they’re just as good simply piled on a plate. Or serve them on top of steamed rice or cauliflower rice. In fact, ever since I realized how good they are without the tortillas, fajitas have become my go-to dish to order at Mexican restaurants. I think they are, especially if you don’t serve them in flour tortillas. Look at the simple list of ingredients. Chicken, vegetables, healthy avocado oil and spices. 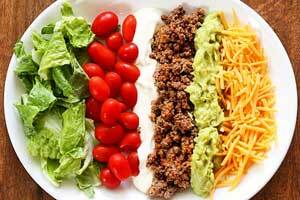 They are low in carbs, and they are a good source of protein, and of vitamins A, B6 and C.
You can keep leftovers in the fridge, in an airtight container, for 3-4 days. Reheat them gently, covered, in the microwave on 50% power. 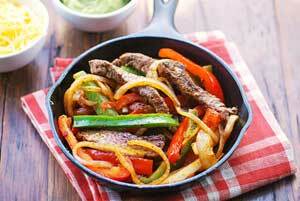 If you prefer beef to chicken, I also have an excellent recipe for easy and healthy steak fajitas. Place the chicken slices in another large bowl. Sprinkle with the remaining seasoning mix. Use your clean hands to rub the spices into the meat. Wash your hands thoroughly. Heat 1 tablespoon of the oil in a large, deep skillet over medium-high heat, about 2 minutes. Add the bell peppers and the onions. Cook, stirring often, until just tender, about 5 minutes. Using a slotted spoon, remove the vegetables to a plate. Add the remaining oil to the skillet, then add the chicken slices. Stir-fry until chicken is fully cooked, about 5 minutes. Return the vegetables to the skillet. Stir-fry everything together 1-2 more minutes, until heated through. Serve the chicken fajitas in bowls, drizzled with the pan juices, and topped (if you wish) with salsa, guacamole, sour cream and shredded cheddar. Obviously, you can also spoon the chicken fajitas into warm flour tortillas, if you don’t minds the carbs/grains. Nutrition info does not include tortillas or toppings.